While California moves to ban the use of Styrofoam containers from the take-out food industry, Montreal is at least trying to figure out how to recover and recycle this ubiquitous material. Montrealers still have until August 31 to bring their Styrofoam containers and other Number 6 plastics to the Eadie Ecocentre, at 1868 Cabot Street, as part of a pilot project to determine whether these materials can be recycled in a way that is both economically and environmentally viable. “We have to prove that it (recycling Styrofoam) can be profitable. We have to create a demand for this material,” says Claude Maheux-Picard, head of the pilot project being carried out by industry, research and City of Montreal partners. For more about the Montreal pilot project, please see my original article at Montreal.OpenFile.ca, “Montreal pilot project tests recyclability of Styrofoam”. The bill would apply to all restaurants and grocery stores, but only for prepared foods. 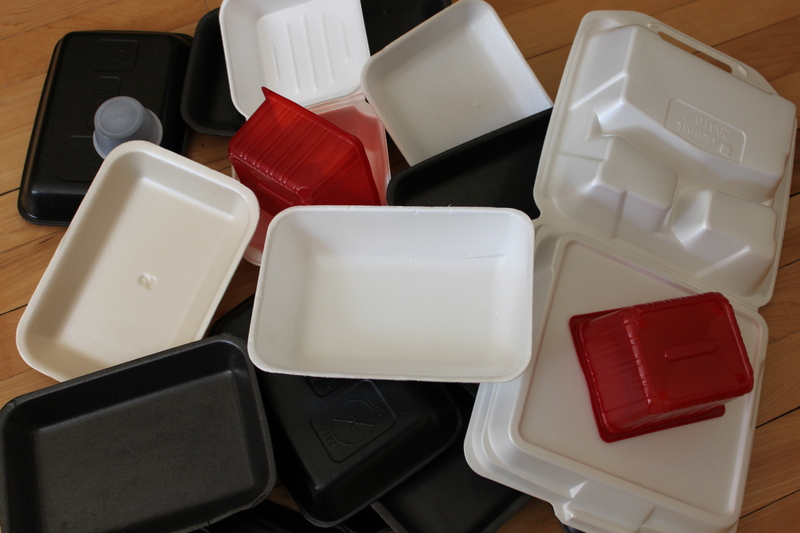 Polystyrene foam containers would still be allowed in cities or counties with a recycling program for this material. (See full text of Bill 568, or its history and status). The Assembly is scheduled to hear the bill at the end of August; if it passes there, it will move to the governor’s desk. It seems unlikely that Montreal would even consider such a ban. Food vendors love Styrofoam because it is lightweight, solid, an excellent insulator, and cheap. “There are definitely other options on the market, but they’re more expensive,” says Claude Maheux-Picard, head of the Montreal pilot project and technical director of the Centre de transfert technologique en écologie industrielle, the research centre that will study the material collected. 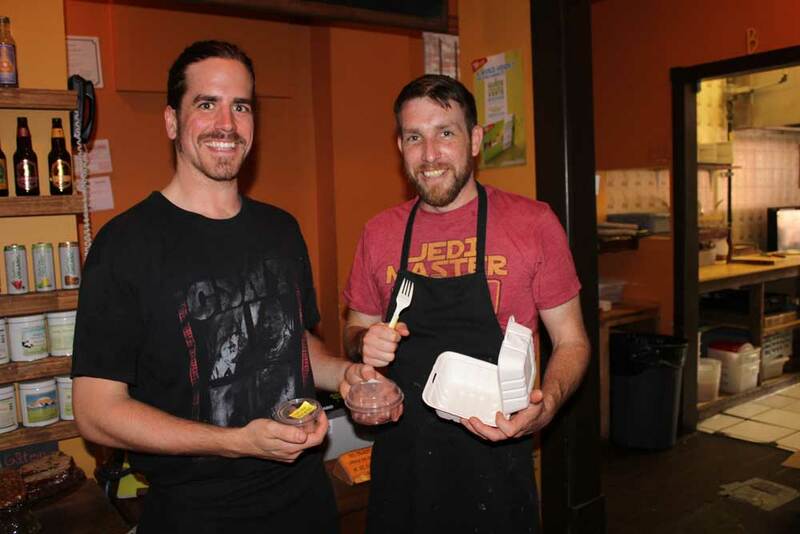 Steve and Jono Aitchison, Burritoville owners, display their compostable restaurant ware. But a few local vendors have made the switch. Burritoville has been using strictly compostable items for take-out since it opened at its Bishop Street location three and a half years ago. To wrap the burritos, they use paper with a soy-based waxy coating; take-out cartons are made of sugar-cane fibre, plastic containers for sauces are made from corn syrup; take-out cutlery is made from potato starch. To help offset the costs, the restaurant charges an extra 25 cents for take-out orders. It doesn’t quite cover the costs (one order usually includes several items), but it helps — and it raises customer awareness. They also encourage customers to bring their own containers for take-out. And they make yummy burritos, too.